1st December, Wroclaw, Poland: Asians swept the titles of the 48th QubicaAMF World Cup when Shayna Ng became the second Singaporean to win the women's crown while Syafiq Ridhwan made history to become the first Malaysian to win the Men's title. Ng, who made the stepladder grand finals of the women's division in third position, had to work doubly hard to beat defending champion and two-time winner, Aumi Guerra of Dominican Republic, 2-1 in the finals. Despite rolling 224 in the first match, the 22-year-old national bowler lost to Guerra's big game of 269. But in a nail-bitting second game, Ng edged the Dominican, 267-259 to draw level at one-all and forcing a third deciding match. As Guerra failed to repeat the form she showed in her two earlier games and encountering three splits and a fourth opened frame, Ng cruised home with 247 to beat the top seed, who could only managed 169. In the earlier semi-finals, Ng sailed past Kirsten Penny of England and needing only two games to beat seond seed Penny, 246-215 and 231-191 to advance to the finals and challenge Guerra. "I had to fight my way up from third but it did mean that I got used to the lanes for the finals and Remy really helped me make lots of adjustments, so many that I had to write them down to remember them, said Ng. "It has been a great experience working with Remy. This is my first world title and I'm a record holder as well!" 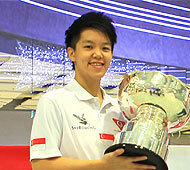 Ng's victory is Singapore's second in the World Cup after Jasmine Yeong-Nathan, who won the women's title in Hermosillo, Mexico in 2008. The newly-crowned champion had topped the the four blocks of 5 games each in the qualifying rounds to advance to the top 24 round in which Ng also retained pole position to move into the top 8 round-robin finals. Aumi Guerra topped the round-robin with 8457 ahead of Kirsten Penny in second wth 8445. Perfect gamer and World Youth gold medlaist, Danielle McEwan of USA missed the stepladder finals in fourth with 8158. Meanwhile, newly-crowned Chinese Taipei Open champion, Syafiq Ridhwan made history by becoming the first Malaysian to win the World Cup title. Syafiq took two games to beat top seed, Marshall Kent of USA, 236-225, 237-221 in the finals. Syafiq, who was also seed third and like Ng, had to go to the third and deciding game to beat second seed, Andres Gomez of Colombia, 234-236, 224-201 and 258-213 in the semi-finals to face the American. 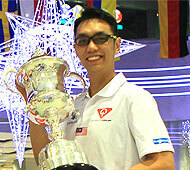 "I think I was lucky to play on the championship lanes first," said Syafiq. "I learnt how to play the lanes and I got better carry in the final match. It is such an honour for me and my country as I am the first Malaysian player to win this wonderful tournament." GCC Championship Masters gold medalist and debutant, Hareb Al Mansoori of UAE was the most unlucky competitor of the tournament when he rolled 161 in his final game to miss the cut by 30 pins. The Emirati had trailed Kent throughout the qualifying rounds right to the round-robin finals. QubicaAMF Worldwide is the founder, organiser and principal sponsor of the Bowling World Cup. Additional information on the QubicaAMF Bowling World Cup, including archives and bulletins for this year’s event can be found on www.qubicaamf.com. QubicaAMF Worldwide is one of the largest bowling products companies in the world. With worldwide headquarters in Richmond, Virginia, USA, and European headquarters in Bologna, Italy, the company manufactures a complete line of high-quality, innovative solutions for new and existing bowling and entertainment centres. Photos courtesy of Hero Noda in Wroclaw, Poland.